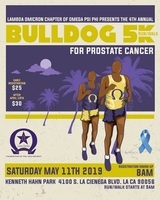 The 4th Annual Omega Bulldog 5K Run/Walk to fight prostate cancer will takes place at the scenic, Kenneth Hahn Recreational Area. The race starts at the top of the park, better known as the Bowl. The route loops around the bowl and proceeds south down a scenic path toward Stocker Ave. At Stocker, the runners return back up the path for a final loop around the bowl. There are two hills and a few curves as the course follows around the bowl, and one hill on the return from Stocker. The Omega Bulldog 5k Run/Walk is and event you don't want to miss, and it's all for a worthy cause. So register early to ensure your spot. Run takes place at the scenic, Kenneth Hahn Recreational Area. It starts at the top of the park, better known as the Bowl. The route loops around the bowl and proceeds south down a scenic path toward Stocker Ave. At Stocker, the runners return back up the path for a final loop around the bowl. There are two major hills and a few curves as the course follows around the bowl, and one hill on the return from Stocker. Parking: Parking is limit, so make sure to get there early. Kenneth Hahn Recreation Area park access fee is $6:00. Carpooling is suggested. Pre-Run Snacks/T-Shirts/Medal: Pre-Run Snacks, T-shirts and Medals will provided as part of your registration package. We'll see you on race day! Omega Psi Phi, Fraternity, Inc.